St. Joseph’s College of Business Administration, Bangalore | SJCBA Bangalore – Direct Admission, Fee Structure, NRI Quota, Management Quota, Admission, PGDM admission, MBA admission, BBA admission, B Com admission. 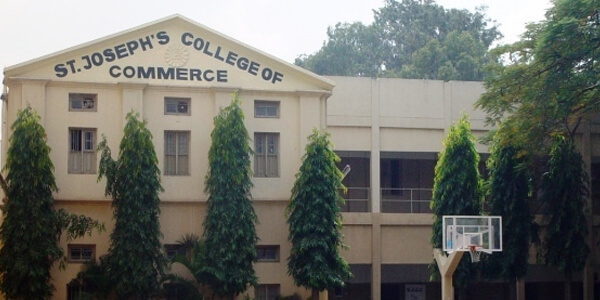 St. Joseph's College of Business Administration (SJCBA) Bangalore was established in 1968. It's a full grown steady institute and nowadays has over 6000 students involved at the UG and post graduate courses in Arts, Science, Commerce, computer and Management disciplines. The Jesuit Fathers came into the image once the Paris Foreign Mission gave over all St. Joseph’s establishment to them. This Institute is currently beneath the Management of the Bangalore Jesuit educational Society. Infrastructure in this college gives high class Library, Computer Lab, Class Room, Hostels, Sports facilities and canteen. College gives student profile with diverse educational background and corporate exposure for their bright future. It is located in the heart of the Bangalore city at Cariappa Road, (Residency Road) Bangalore. St. Joseph's College of Business Administration Bangalore (SJCBA) students get placed throughout the second last and last term of the last year. Placements happen both ways on-campus and in off-campus locations. SJCBA includes a smart name among recruiters and boasts of a robust network of alumni operating in numerous multinational firms. Top recruiters like Akamai Technologies, Axis Bank, Conzerv Systems Pvt Ltd, Decathlon Sports, Fidelity Investments, Fortis Securities etc. visit the college every year. SJCBA granted AICTE approval to enhance the intake from 60 to 120 students in the year 2007 and also secured approval from the AICTE for offering the Executive PGDM and PGCM programs. Students looking into management degree can go for management quota, nri quota direct admission and take fee structure for PGDM, PGCM, BBA, MBA and B Com admission. Student should be Graduate or a Postgraduate Degree in any discipline from a recognized University with more than 50% Aggregate Marks.